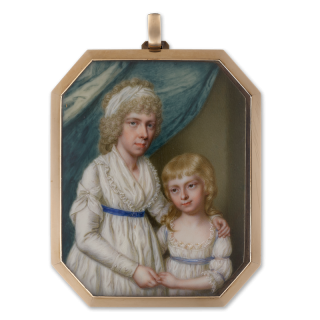 This portrait miniature by James Scouler, depicting a mother and her daughter holding hands, is representative of the artist’s ambitious compositions and superb draughtsmanship. Few artists of the later eighteenth century attempted to include more than one sitter in their works, but Scouler was determined to paint miniatures which rivalled the oil paintings they were shown alongside at the Royal Academy. As here, he was able to convey, more convincingly than other miniaturists of the time, naturalistic facial expression. The slight smile playing on the lips of the young girl in the present work is in contrast to the more serious expression of her mother as she stares out of the frame at the viewer. Scouler was not born into a wealthy or artistic background – he was from an Edinburgh family where his father made his living as an organ builder. He followed his father into this profession but his talent for drawing must have been prodigious, as, at the age of about 15, he won a prize for drawing from the ‘Society for the Encouragement of Arts, Manufactures and Commerce’. 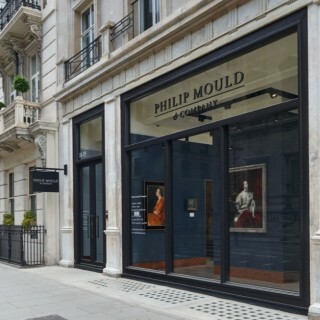 He went on to attend the drawing classes at the St. Martin’s Lane ‘Academy’ run by William Hogarth and studied the classical sculpture at the Duke of Richmond’s Gallery which opened to students in 1758. This education served him well – as can be seen in the current work he had a confident grasp of both anatomy and drapery.